Countless trillions of dollars are stashed in scores of tax havens worldwide – black holes of hidden wealth, much of it ill-gotten. Largely tax-free, they’re controlled by Wall Street and other powerful financial interests, part of a global tax injustice system, governments complicit with super-wealthy individuals and financial institutions managing their money. 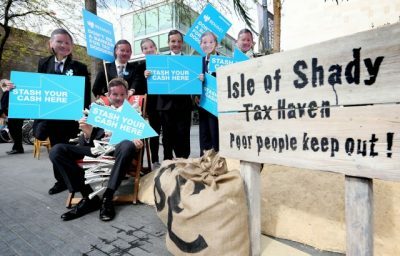 Well-known tax havens include the Cayman Islands, Bermuda, the Bahamas, the Channel Islands, Monaco, Gibraltar, Switzerland, Singapore, many other locations – and Israel since Amendment 168 to its Income Tax Ordinance became law in 2003, expanded in 2008. It makes new immigrants and returning ex-pats living abroad at least 10 years exempt from taxes on foreign assets for 10 years – whatever their source. Other Israeli citizens are taxed on all their income – whether earned domestically or abroad. The law turned Israel into a tax haven also encouraging aliyah, emigration to Israel, making it worth their while financially. The capital gains exemption is the most attractive part of the law, a major incentive to emigrate, foreign assets of super-wealthy immigrants shielded from taxes. According to former Israeli finance minister Yair Lapid’s testimony to police, Netanyahu unsuccessfully tried to extend the Amendment 168 tax exemption to 20 years – on behalf of super-wealthy friends providing him with lavish illicit gifts amounting to bribes, according to possible charges coming against him. Migration expert Andrew Amolis calls Israel a leading destination for super-wealthy individuals for the past few years, many from France. They consider it safe, along with offering attractive business opportunities. Tax-sheltered foreign assets makes it a leading money-laundering destination, including fraudsters with ill-gotten gains. Even after 10 years, Israel’s Tax Authority would be hard-pressed to levy appropriate taxes on individuals emigrating to avoid paying them. If tax haven benefits expire, they’ll go somewhere else. They have lots of accommodating choices worldwide.